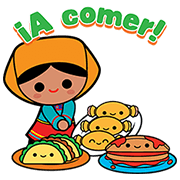 http://www.line-stickers.com/ – Antojitos México Lindo Line Sticker | These stickers will satisfy even the hungriest of stomachs! Have fun with these delicious México Lindo stickers. This set’s got taquitos and whatever else you and your friends are craving! Previous post Paojie – What’s Up!